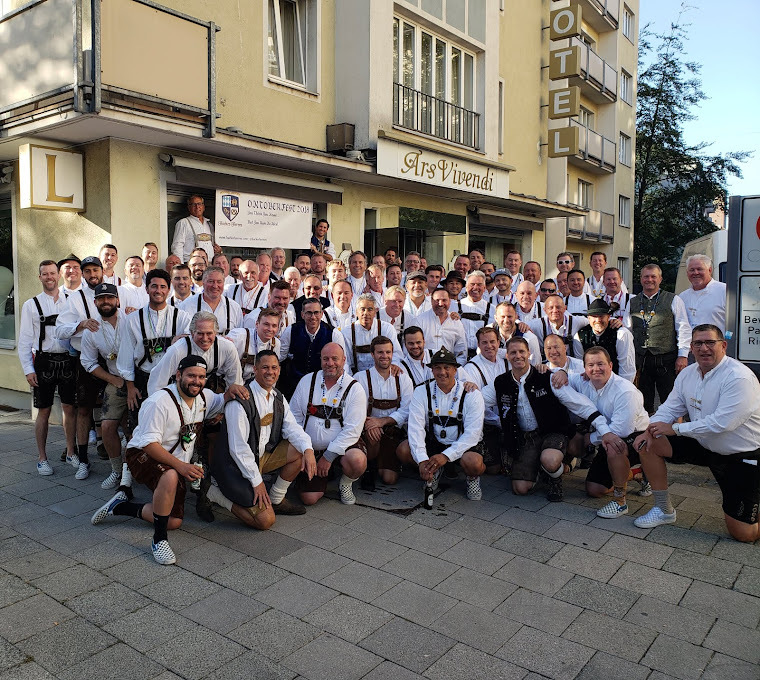 80 men from around the US, Canada, UK, Germany, and Singapore convened on the Hacker Festzelt for the 26th year. RigoBigo (Rigo Bojorquez) brought the ROY hat back to the 909. He's the third winner from the Inland Empire, Corona, CA. MoJoe (Joe Ullrich) easily won the HAM award for the veteran of the year. Both guys exhibited the spirit of "gemutlichkeit" at Oktoberfest. The friendliness, openness, and spirit of good times that makes Oktoberfest the magical season that it is. We relived Oktobefest 2016 with lots of the Hacker Herren from the Bay Area. We will held it at Barons Jewelers at 7:00pm-10:00 pm. The Little Red Riding Truck @redridingtruck provided schnitzel and brats for our enjoyment. We had some malted beverages for all to enjoy too. This year we have another great video to watch that Jason Cunningham made for us with all of the pictures that you submitted. Everyone is welcome, whether you have been to Ofest with us or not. Yes women are welcome to the reunion party!! Thanks for attending Lauren Metheny!! Sept 26-28, 2019 You'll have to watch your Ars when you arrive here. Click on picture for hotel address and details. Do You Want Higher Quality Lederhosen Direct From Germany?